Planning a getaway? The best deals are here. 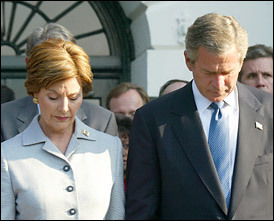 President Bush and the first lady lead the White House staff in a moment of silence this morning. One year after it faced its own mortality, New York, in its daily curiosities and unexpungeable flavor, is still New York. For some time, no one knew if that could happen. It is 365 days later. Do we look differently at death now? Are we more comfortable with the open secret of our certain mortality, or do we find it more terrifying? Can These Boxes Be Locked Against Terror? In his video photojournal, Dith Pran recalls scene across the Hudson River on Sept. 11, 2001. Search by last name for profiles of the victims. Watch a video clip from a New York Times film on 20 of the victims. Reflections and ongoing discussions about the events of the last year.